All OK in isolation and moderation. But when they’re combined, they will waste your time and strangle your dreams. One day, you’ll look back and wonder where the years went. You’ll ask why you didn’t achieve more and it will be difficult to pinpoint one single reason. Because it’s rarely one single reason or an isolated incident. It’s an accumulation of dozens, hundreds, perhaps thousands of missed opportunities to do something meaningful with your time. It’s the result of the consistent choice to do OK things at the expense of the great. 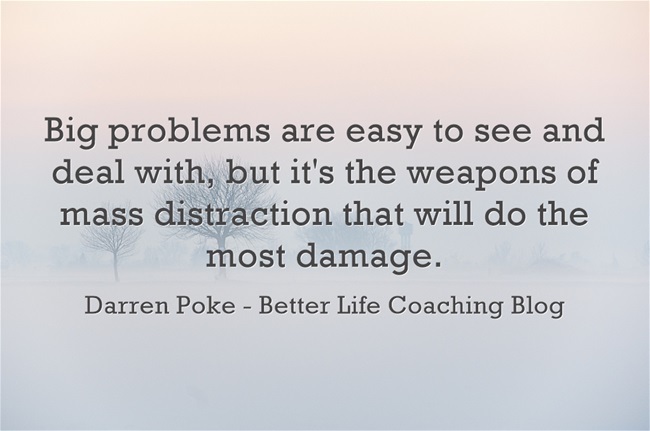 Big problems are easy to see and deal with, but it’s the weapons of mass distraction that will do the most damage.